I got excited about painting last week. I saw that a local craft store was having a sale on canvases and I decided to treat myself to some that were bigger than any I had on hand. The new ones are 18” x 24” and I took them home thinking I just couldn’t wait to get started on a new painting. There were other things I needed to do first, of course. Lots of things. As it turned out, an almost endless number of things, all of which were way more important than indulging my burning desire to paint. I needed to cook meals. I needed to do laundry. I needed to buy groceries. I needed to sweep the living room floor. I needed to wash dishes. I needed to sit. I needed to read. I needed to read about how to paint. I had a lot of good reasons for not painting right away. The longer I put it off, the harder it was to imagine starting to paint. What would I paint? We ate the mangoes. There weren’t any other attractive fruits in the house. There was some nice scenery outdoors, but the weather was unreliable and when it did clear up, that was tie-dye time, not painting time. I kept procrastinating, in the name of all kinds of really important stuff that I absolutely had to get done, until blog day rolled around and I realized it had been a whole week and I hadn’t painted anything. Did I want to end up blogging about procrastination again? I did not. I was obviously not going to complete a big painting in the time I had left. 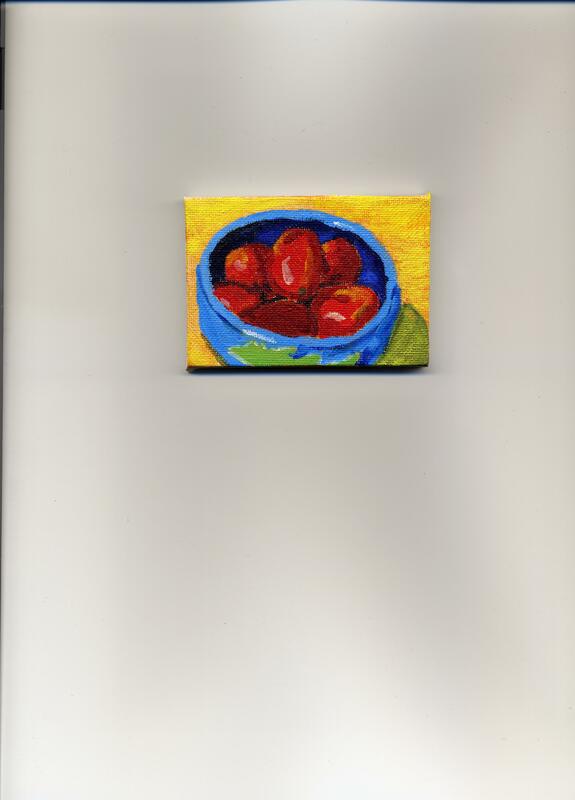 Fortunately, I had also picked up a five-pack of tiny canvases. I decided I could manage one of those. I found a little blue bowl – something I had glazed myself in one of those “paint your own pottery” places – and I filled it with grape tomatoes. It was small and cute, just like my canvas. All right! This was something I could paint! It’s itty bitty, but it’s a painting, and it counts. This entry was posted in Uncategorized and tagged creativity, painting, procrastination, tie-dye on February 28, 2014 by releaf1954. I’ve been thinking about new goals for my second blog year and I’ve decided that fifty things in a year is a pretty reasonable goal. The difference, this year, is that I want to do fifty paintings. That will average out to about one per week and that seems doable. I may not do one every single week. That would be ideal, but I will consider the challenge met if I do fifty before I turn sixty-one, even if I end up cramming half of them into the last few weeks before my birthday. That doesn’t mean I won’t be doing other creative things. I hope I will be doing lots of different things, but I want to put some real time and effort into learning to paint. I’m a little bit afraid of this commitment. I fear I might paint and paint and paint and never improve. It’s that fear that has stopped me, every other time I’ve thought about learning to paint. I don’t want to let it stop me this time. No one is born knowing how to hold a brush or mix colors. There are things that can be learned, but not if I stop trying after one disappointing attempt. I want to learn what I can learn. Maybe it will be a little; maybe it will be a lot. I’ll never know if I don’t try. I will have to tell the perfectionist part of me to hush up and let me try. I’ve been wanting to paint since I was a teenager and I have let a lot of years go by without giving myself permission to start out by doing it badly. I have to start where I am, with tools and desire, but no skills. I have to practice. If it were possible to acquire skills just by reading books and magazines about painting, I would have mad skills already. No, I’m going to have to actually pick up a brush and paint. That’s what I want to do in my sixty-first year. I want to thumb my nose at the fear of painting badly, and just paint anyway. I want to keep painting, even when the painting in front of me doesn’t look anything like the actual thing I’m trying to paint or the imaginary masterpiece in my head. Which is definitely the case with this first painting of my sixty-first year. I was at the grocery store and I went into the produce department and picked up the first pretty fruit that caught my eye: two colorful mangoes. I took them home and set them up on a piece of hand-dyed blue fabric and I tried to capture them on canvas with acrylic paints. Here it is. It’s a painting. I painted. On the upside, I have finished using these mangoes as models. Now we can eat them. This entry was posted in Uncategorized and tagged creativity, fear, goals, painting on February 21, 2014 by releaf1954. What? It’s blog day again, already? Where did that week go? I will admit it right now: I did not paint this week. I did take myself on a celebratory shopping trip to JoAnn, where I bought a Sta-wet palette. There’s a Michael’s in the same shopping center, so I walked down there and bought a tube of acrylic paint. I was offering enticements to my inner artist, but I think she was still tired from the late-night stitch-fest last Friday. She did not take the bait. All of my inner children and I are still recovering from that final sprint to the finish line. I don’t want to lose the momentum I built up in that last month, but I need some quiet time right now. I survived Halloween, NaNoWriMo, Thanksgiving, Christmas and Tax Season. 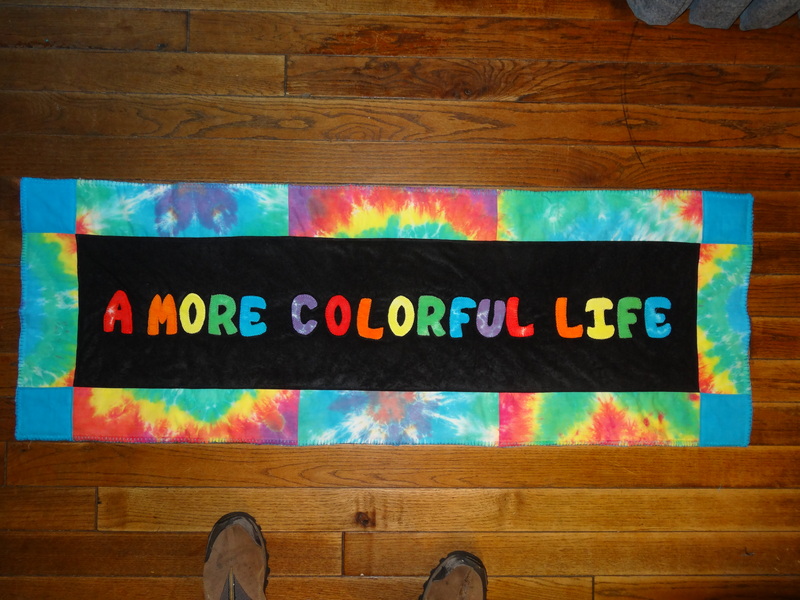 I need a rest before I dive into festival season, which starts in just a few weeks and is the busiest time of year for the tie-dye business. “Maybe this will be the year I finally make an art quilt. Maybe this will be the year I finally make an art doll. Maybe this will be the year I paint.” I was so sick of writing that and never doing any of it that I knew I had to find a way to make a real change, a way to break the block. This blog was the way. I put it all in writing and I sent it out into the world. Once it was out there, I couldn’t take it back. I had to follow through. I did follow through and I met my goals. Now I need new goals and I’m not sure what to do. I need to rest and ponder and figure out what’s reasonable. Meanwhile, I baked some cookies. It’s Valentine’s Day. 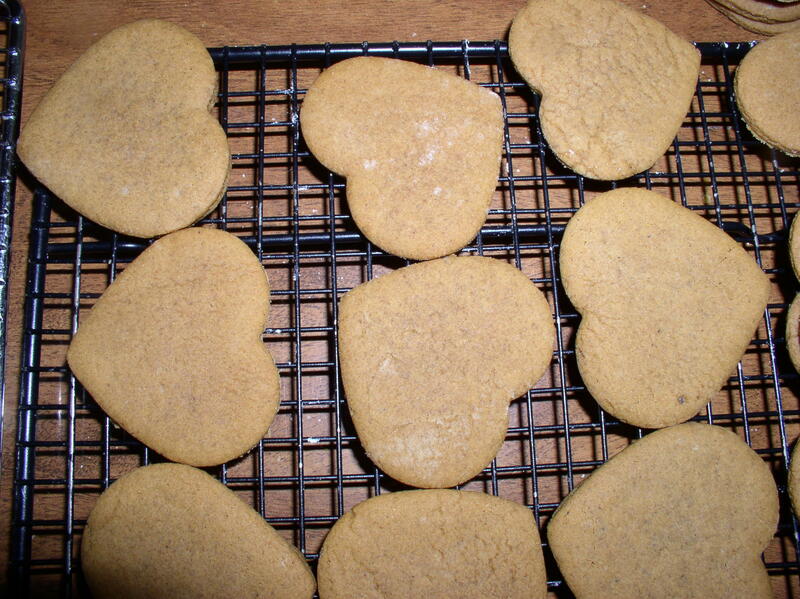 I’m pretty sure heart-shaped cookies are reasonable. This entry was posted in Uncategorized and tagged blogging, cookies, creativity, goals, painting, procrastination on February 14, 2014 by releaf1954. I’ve Been Blogging One Whole Year! I am now celebrating my first blog anniversary. One year ago today, I started this blog with no background color, no profile picture and no idea how the whole experience would affect my life. I soon fixed the background color and added a profile picture, but it’s taken me a year to find out if I could really do the things I set out to do on my fifty-ninth birthday. I have completed my List of Fifty Things. I have created a 16” x 20” painting. I have made an art doll. Just in time for the last day of my sixtieth year, I made an art quilt. Of course, I never intended to procrastinate quite that long, but I’m not surprised that it happened. I’m guessing you are not surprised, either. The point is, I did it. I set some creative goals and I achieved them. I’m feeling good about that. Really good. My inner children want to sing a song and do a happy dance and eat cupcakes, but staying up until midnight last night has left this sixty-year-old woman too tired to throw a big party, even if most of the guests would be non-corporeal manifestations of my own consciousness. The spirit is willing but the flesh wants a nap. I do want to celebrate here, though. I love all the things on my List of Fifty Things, especially the Big Three, but the one accomplishment that gives me the most joy is the blog itself. It got off to a shaky start. I did a few posts in February and March, setting some reasonable goals, and then I disappeared from the blogosphere until July. I got fed up with myself for not doing the one thing I most wanted to do and I finally made the commitment to publish a post at least once a week, whether I had met any of my creative goals or not. I treasure that commitment. I love having this weekly date with my writing self. I feel safe knowing that I can be trusted to show up and write something, no matter what happens. I feel relaxed knowing that it doesn’t have to be brilliant. I had to give up blog perfectionism early on and that set me free to just be honest and have a good time. This is playtime for me now, and I will not be giving it up. I’m not giving up the other creative pursuits, either. I still have inner children waiting for their Altoid Tin Shrines. I rediscovered my love for sewing and embroidery and I’m excited about trying new projects. I am surprised to realize that the one thing that pulls me the most right now is the desire to learn more about painting. That one 16” x 20” painting changed the way I look at the world. For several days after it was finished, my eyes saw possible paintings everywhere and the whole world looked prettier. The feeling faded as I moved on to other necessary projects, but my heart is full of hope that it will return and grow stronger if I put my attention into painting again. 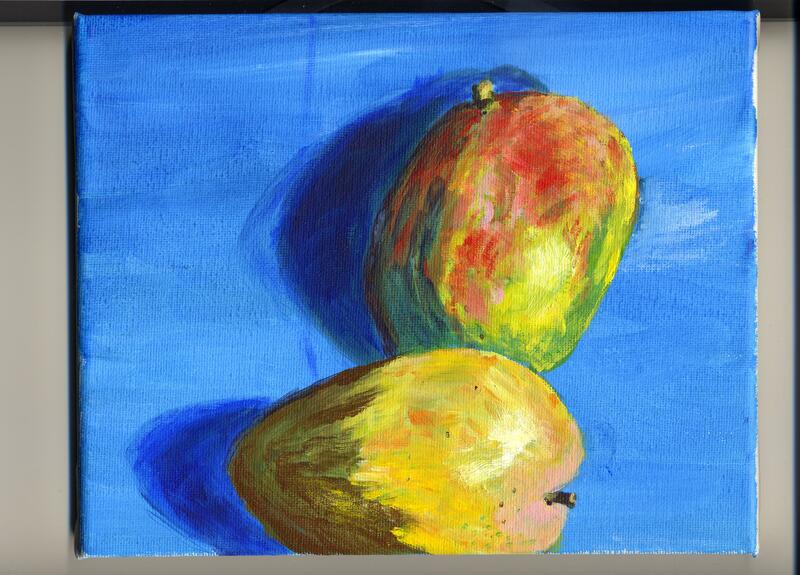 I believe painting will be my focus for my sixty-first year. I haven’t decided yet whether I will set specific goals about that. I’ll have to let you know. I need to rest and recover from that last project, and then we’ll see. Meanwhile, I promised I would show you that last project. The tale of its construction would take up several blog posts, with numerous citations of Murphy’s Law, but I will just say that there ended up being a lot more handwork than I had planned and I believe I have mastered the blanket stitch. It’s highly imperfect and I will not be showing you the back of it, but I love the way it turned out. If you clicked through to WordPress, you’ve already seen it in close-up. After a whole year of blogging, I finally have a header. Do you think it’s colorful enough? This entry was posted in Uncategorized and tagged art quilt, blog anniversary, blogging, celebration, creativity, embroidery, goals, joy, painting, procrastination, writing on February 8, 2014 by releaf1954. Woo hoo! I did it! It is 11:30 on the last night of my sixtieth year. I just finished my art quilt. You’re going to have to take my word for that right now. Trust me, the thing is done. Today is Friday and Friday is blog day, so I want to publish this before midnight. That means I don’t have time to photograph my art quilt and share it with my readers, but I promise you that I will return tomorrow to do that. For today, I’m just going to say, “Woo hoo! I did it!” I procrastinated until almost the very last minute and I had to stay up way past my bedtime to get this last thing done, but I have met the challenges I set for myself when I started this blog on my fifty-ninth birthday. I am bleary-eyed with exhaustion, but I have completed the quest. This last post of my sixtieth year, like the first post of my sixtieth year, will be very short. This entry was posted in Uncategorized on February 8, 2014 by releaf1954.